Get rid of your dentures – permanent fixed implanted teeth are available now. A missing tooth or loose dentures can cause a number of personal and practical issues in your everyday life. Eating, chewing and speech- not to mention general self-esteem- can be seriously affected by sore gums or gaps. Dental implants are a functional, safe and long term solution, significantly helping to improve quality of life and enabling you to feel happy and confident again. Implants are generally suitable for most people, no matter your age, the condition of your teeth or the number of implants you require. We can offer a number of treatments to help enable you to smile freely and live the life you want. Priory Dental Clinic are pleased to be able to offer dental implants in Kenilworth. We also have a number of patients in Coventry and the surrounding area, so get in touch for a free consultation! Once established, implants are well-fixed and strong meaning that they don’t move around- bringing an end to the discomfort and pain often caused by dentures. Dental implants help to protect the jawbone from shrinking due to a lack of stimulation which in turn can cause premature ageing in your face. They also help to prevent remaining teeth from moving around or food getting stuck in gaps and potentially causing gum disease. Dental implants can greatly help to improve speech and the ability to eat and chew foods. 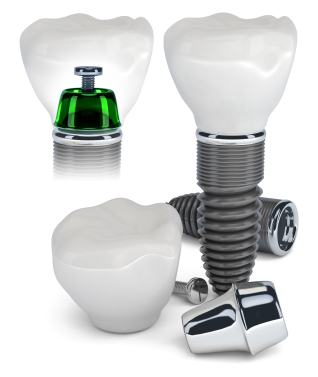 Depending on your needs, implants can be used to replace any number of teeth. Plus they don’t affect any of your remaining teeth in any way. Self-confidence and lifestyle can be significantly improved due to the change in appearance and ability to eat more freely. Dental implants mimic the structure of a natural tooth and consist of a titanium root which is placed into the bone in your jaw and a manufactured crown which is fixed on top. Insertion is generally straight forward and takes around 15 minutes (for less complex cases). Once fitted, the implant needs to establish itself over a period of 3-6 months while bone grows naturally around it- fusing it to the jaw and creating a solid base. At this point the crown, bridge or denture can be fitted. Made of porcelain, it looks natural and is strong and hard-wearing- just like your existing teeth. During this recovery period, temporary restoration will be fitted if required and full dentures can also be worn. Good general health is important and should be taken into account before undergoing any dental implant surgery. Patients with diabetes or who are heavy smokers have a greater risk of developing gum disease and infections following surgery. A thorough assessment will be carried out before surgery and, taking into account patient requirements, a long-term plan will be drawn up to include regular after care. It is important to maintain good oral hygiene standards in order to avoid infection and discomfort. If implants are not cleaned properly then plaque will form- causing infection, bleeding and soreness. Implants usually take place under a local anaesthetic although a sedative will be considered in some cases where treatment is more complex or lengthy. No pain should be experienced during the procedure, although you may feel slight discomfort in the immediate days or weeks following it. Overall, dental implants are a safe, long-term option for many people and can boast a success rate of 95%. With regular long-term care and if they are looked after correctly they can last for 15 years or more.